These days, marketers are being put under increasing pressure to “prove” that marketing dollars are being put to effective use. No more are the days of simply throwing up an ad on television or a post on a social network, and calling it good. Stakeholders and clients want results. They need to know that budgets are being used effectively. As this demand has grown so has the available analytics tools, ensuring that both marketers and stakeholders can leverage insights and pivot as needed. Why is Analysis and Reporting Important? Whether there’s a designated person or simply a marketer running the campaigns, who handles it, analytics and reporting are central to the marketing strategy and the overall cycle. 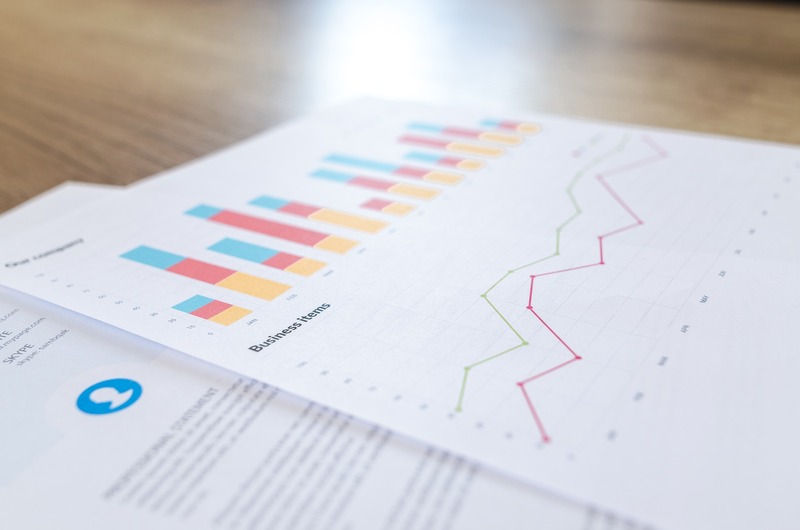 Analytics data provides insights into how campaigns are performing, including whether or not you’re attracting the right audience and receiving positive ROI. Without this data, it’s hard to prove the success of individual campaigns or how all marketing efforts are working together to achieve set goals. These insights can not only be used to tweak current campaigns, but also leveraged to better focus future campaigns and efforts. For example, you can identify patterns of loyal customers, i.e. demographics, income, location, etc., which can be used for future targeting. To gain these insights, however, marketers need proper tools. With so many on the market, sometimes it’s difficult to determine which are the best. What Are the Different Reporting Tools on the Market? Reporting tools vary from free (Google Sheets and Data Studio) to Windows OS formats (Excel and Word) to tools designed for agencies and large enterprises (SAP Crystal Reports and other enterprise-level Business Intelligence tools). Learning curve: Many marketers complain about the difficulty in understanding how the product works and how to gain insights from it. This usually means that they must hire an expert who fully understands how the tool operates. We’ve all see way too often companies that invest in these software programs, which simply are not used. 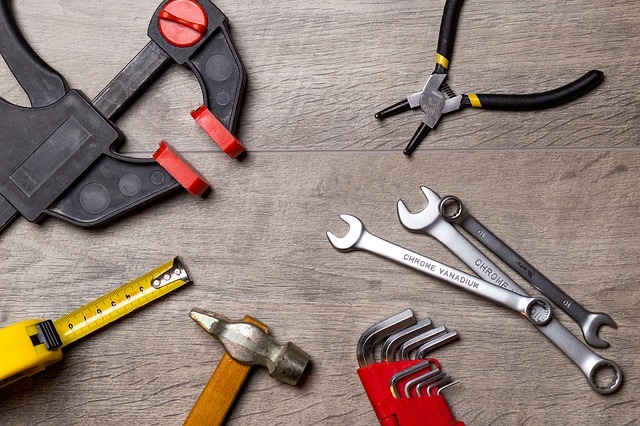 Price tag: Most of these tools cost thousands of dollars a month. Marketers have to justify the cost in comparison to their own staffing and advertising dollar needs. While the tools for agencies are less expensive, they still can run into the hundreds of dollars for larger ones. This is why many agencies still rely on Excel or Word documents for reporting. The issue with these is version control. Typically, there are multiple documents flying around via email. If changes are made, you have to figure out which is the latest iterations. That can lead to frustration or presenting the wrong file. Plus, there’s even a chance of the document getting misplaced if a computer is lost or corrupted. Free: No purchase is necessary to use them. Easy-to-use: Google has a myriad of guides to help you with their tools. Plus, they’re so widely used that any questions that you have, have probably already been answered online. Work Online: This allows you to access them from anywhere and eliminates the issue of losing them if a computer goes down. Shareable: No need to send an endless array of emails. Simply share the document or dashboard with whom needs to view or edit it. You can even add permission controls. You can create documents or dashboards with any of your coworkers or stakeholders, and you’ll always have the latest version. Create high-quality reports: Google Sheets allow for in-depth analysis with formulas while Data Studio allows you to create visually-stunning reports. Data Studio allows users to convert data into easily digestible and informative reports and dashboards. 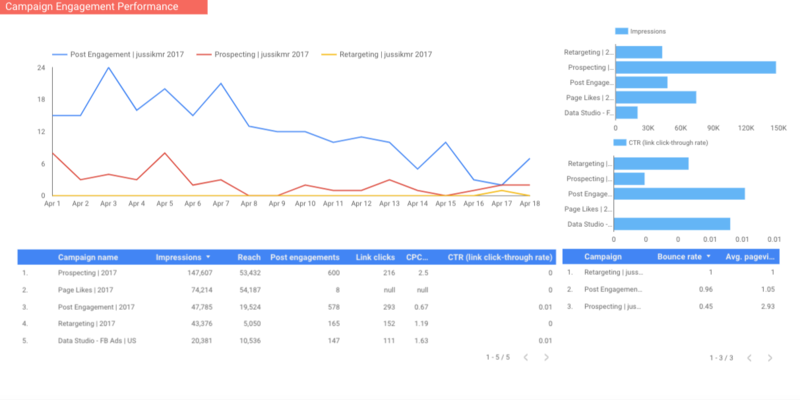 It natively connects with and pulls data from other Google products like AdWords and Analytics, making the tool useful for marketers who wish to showcase their successes and insights. Sheets has a native add-on, which fetches Google Analytics data to create reports. However, the data only from Google’s platforms is not enough for complete marketing reporting and there is a big reason for that. When marketers create reports for their clients and stakeholders, they need to understand how e.g. Facebook campaigns are performing in relation to similar campaigns run on different platforms. Basically, they must see the big picture in relation to various efforts, which includes building reports that contain data and insights from a multitude of platforms apart from Google’s ones. 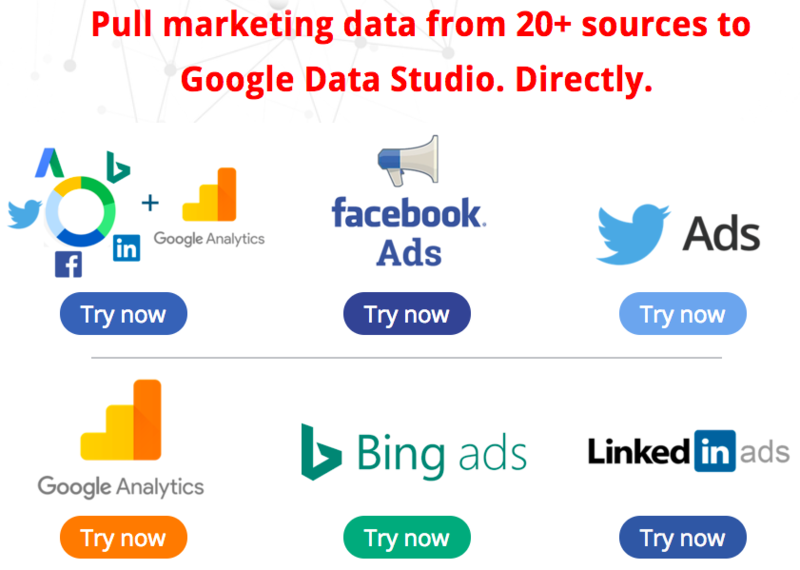 Sheets and Data Studio cannot natively fetch data third-party platforms like Facebook, Bing and LinkedIn, which are used by marketers on a daily basis. So, does this mean that marketers still must create custom reports in Google Sheets and Google Data Studio manually? Thankfully, the answer to that is no. Up to this day, Supermetrics has created more than 40 connectors for Google Sheets and 24+ native Data Studio connectors, which allow to fetch data from multiple platforms. Connectors do just as their name implies: they allow you to fetch data from different data sources and add them to Data Studio or Google Sheets. A template gallery with 30+ ready-made reporting templates for you to jumpstart your reporting. The gallery is accessible to all add-on’s users. If you want to give Supermetrics add-on a spin, just follow this link to install it from the Chrome store. No credit card is required and you will get to experience the full functionality for 30 days! What Should You Include in Your Data Studio and Sheets Dashboards? Your connectors are going to pull in a lot of data – pretty much every possible field available within the reporting templates of your chosen platform. Select the data that is most relevant to you and your organisation. Also, set a default conversion window that is consistent across platforms. You might get overwhelmed at first with all the options. Yet, think about the data that you’ve always analysed on a daily, weekly or monthly basis. Review your old reports, and create a list of the metrics that matter most to you. Then, start building your Google Data Studio or Sheets report. All of your campaign data can be automatically added to a single dashboard or report, and you can set the queries to automatically refresh your data at set intervals. While this is certainly a huge leap in eliminating manual reports, it’s also a leap in helping marketers see how their different efforts both compare and work together. Google Sheets and Google Data Studio are one of the best reporting tools on the market to analyse and visualise data: they are completely free, it’s not hard to learn how to use them and they both work online which allows easy file accessing and sharing. However, in order to unleash the full power of those tools marketers need to use additional extensions and add-ons to fetch data from platforms such as Facebook, Bing and LinkedIn.